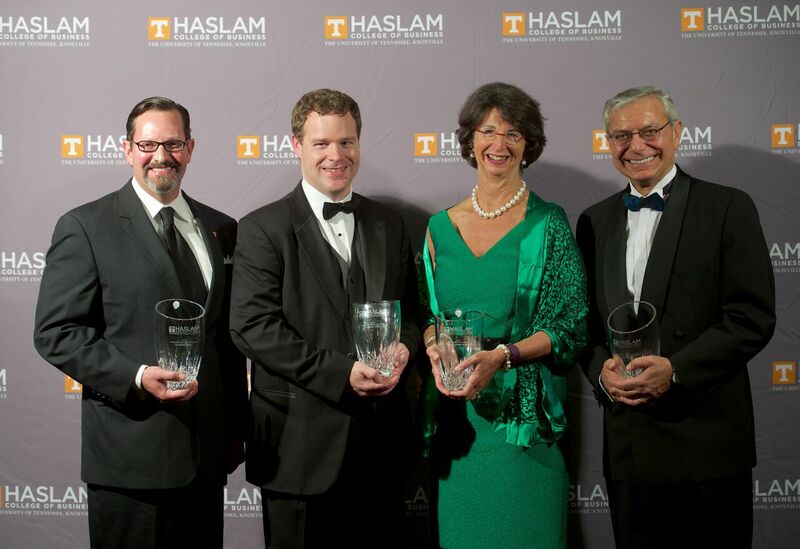 KNOXVILLE—The University of Tennessee, Knoxville’s Haslam College of Business recognized the accomplishments of three alumni and one corporation during its seventh annual Alumni Awards Gala Nov. 6. The college also formally announced its Investing in the Journey to the Top 25 campaign to raise $175 million in support of UT becoming a top 25 public research institution. Approximately 400 alumni, faculty, staff and friends of the college attended the gala, which included a reception, silent auction, dinner and awards presentation. Marshall Taylor (’00, ’01) received the 2015 Outstanding Young Alum Award. Taylor is a managing director in Alvarez & Marsal’s Transaction Advisory Group and has worked at Arthur Andersen’s audit practice in Nashville as well as EY. John Hajjar (’99) was honored as the 2015 Entrepreneur of the Year. Hajjar is a urologist who used his knowledge from Haslam’s Physician Executive MBA program to grow a business of three ambulatory surgery centers into Sovereign Medical Group. The company now includes 69 physicians across multiple board-certified specialties and 15 additional surgery centers along the East Coast. Sharon Miller Pryse (’72) was honored as the 2015 Distinguished Alum. Pryse was one of a few female business majors at the time of her graduation, and in 1986 founded the Trust Company, which now manages nearly $3 billion in assets. SouthEast Bank was recognized as the 2015 Outstanding Corporate Partner for its contribution to the college’s Global Leadership Scholars program as well as support of the university’s academic and athletics programs. Six of SouthEast Bank’s scholarships support GLS students. Proceeds from the sponsorships and silent auction benefited the College Fund, which allows Haslam administrators to allocate dollars toward areas of greatest need, including student and faculty support. The college has more than 4,200 undergraduates and 400 graduate students. Greater than 20 percent of UT’s undergraduates come from the Haslam College of Business. In 2014, the college became the university’s first named college after a historic $50 million gift from the family of James A. Haslam II (’52). Haslam is a former vice chair of the UT Board of Trustees and a UT Distinguished Alumnus. A former Vol football captain, he founded the company now known as Pilot Flying J. For more information on the Investing in the Journey to the Top 25 campaign, visit http://haslam.utk.edu/journey. For more information about the Haslam College of Business, visit http://haslam.utk.edu.